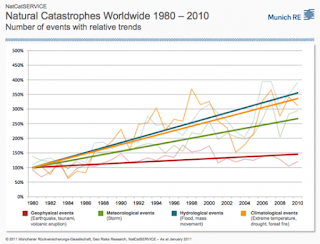 Mabinogogiblog: Are extreme weather events increasing? Are extreme weather events increasing? From the news, it certainly looks as if extreme weather is increasing. In 2012 for instance, we had high rainfall and floods in the UK, and record high temperatures in the USA. Australia is currently having a massive heatwave. But news reports are anecdotes, not data. Science has to look at all the data, across space and time, not just bits thrown at random in our direction by journalists. This post is subject to updating as I find new data. Is there any objective evidence that extreme weather events, worldwide, are increasing? The question is not, are insurance payouts on weather damage increasing? (They are, but this is mixed in with all sorts of economic factors like the value of houses &c). Nor am I asking, is anthropogenic climate change causing extreme weather events? This is the science of attribution, it is highly complex, and although several studies are coming up with affirmative answers, this is not the present question. So. Are extreme weather events increasing? It shows upward trends in events - not costs. Interesting that they find an upward trend even in geological events. [update March 2018] Globally, floods have increased fourfold since 1980, and by 50% in the last decade. The causation of flood is complex, varying not just with intensity of precipitation, but also with urbanisation, deforestation, loss of natural floodplain storage, as well as river and flood management which have strongly affected flood occurrence. Min et al. refer to the "observed intensification of heavy precipitation events found over approximately two-thirds of data-covered parts of Northern Hemisphere land areas." On the other hand, there are a trio of papers claiming a decrease in floods around the world. One, by Kundzewicz et al. (2005) depended on analysis of annual maximum flows. Annual flows may not necessarily be a good indicator of flooding, since floods tend to result from intense precipitation limited in space and time (i.e. downpours). Rivers can cope better with long-term, steady precipitation. AGW theory predicts increased downpours. So a river basin could have periods of low precipitation alternating with high intensity precipitation, which could leave the average in place, yet lead to flooding. In Europe, it seems that the jury is still out on actual flooding. What is pretty certain is that extreme rainfall is increasing. This is easily measurable in rain gauges, and Seth Westra of the University of Adelaide looked at 8000 rain gauges from 1900 to 2009, and found that for every 1C rise in temperature, there will be a 7% increase in extreme rainfall intensity. This is in line with theoretical projections, since warmer air can hold more moisture. Polson et al. 2013 find that there is an anthropological fingerprint on patterns of precipitation and drought. Dai et al 2011 : "Global aridity has increased substantially since the 1970s due to recent drying over Africa, southern Europe, East and South Asia, and eastern Australia. Although El Niño-Southern Oscillation (ENSO), tropical Atlantic SSTs, and Asian monsoons have played a large role in the recent drying, recent warming has increased atmospheric moisture demand and likely altered atmospheric circulation patterns, both contributing to the drying". 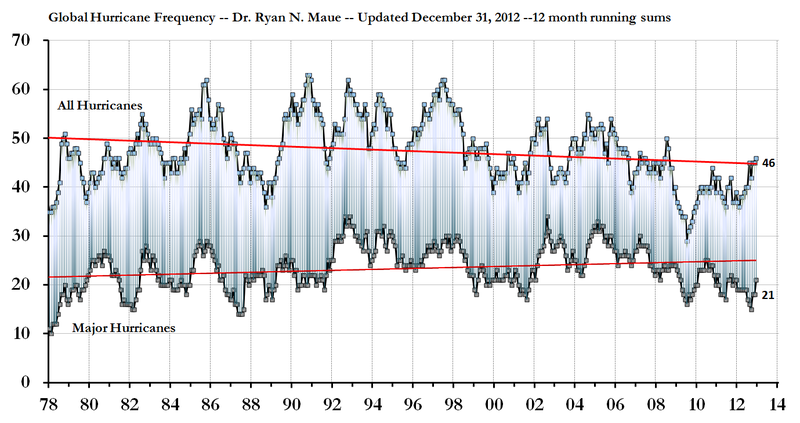 On the other hand, Sheffield et al 2012 calculate that there has been little change in drought over the past 60 years. 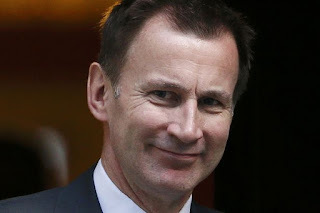 However, it seems that Sheffield has been using models, and therefore his evidence should be ruled out of court by any strict and particular climate contrarian, because they reject all computer modelling. They cannot accept computer models which agree with their view and reject those that disagree. Dai says Sheffield does not take into account trends in soil moisture and other variables and relies on some outdated and questionable data. The IPCC SREX report says: "There is medium confidence that some regions of the world have experienced more intense and longer droughts, in particular in southern Europe and West Africa, but in some regions droughts have become less frequent, less intense, or shorter, for example, in central North America and Northwestern Australia." This makes sense. It is certain that warmer air will hold more water vapour. What goes up must eventually come down. Climate change means that the precipitation patterns are going to shift around: more drought in some areas, less in others. Several papers have found an increase in extreme heat events, and decreased low temperature extremes, as is to be expected. Here is a recent paper by Coumou, Robinson and Rahmstorf. They find "worldwide, the number of local record-breaking monthly temperature extremes is now on average five times larger than expected in a climate with no long-term warming...Summertime records, which are associated with prolonged heat waves, increased by more than a factor of ten in some continental regions including parts of Europe, Africa, southern Asia and Amazonia". Heavy monsoon rains in central India between 1981 and 2000 were more intense and frequent than in the 1950s and 1960s, and increased by 10 per cent since the early 1950s. Severe rains doubled over the same period. Changing pattern of monsoons " there were now longer dry spells and shorter sudden heavy showers, replacing the three month continuous rain which has characterised the Indian monsoon. His comments will fuel fears that climate change will cause increasing hardship for farmers in India, where the failure of the monsoon has already reduced food output by 20 per cent. Ministers reduced the country's growth projection this year by just under two per cent as drought hit crops throughout the country. Finance Minister Pranab Mukherjee this week said there had been a 25 per cent decline in rainfall this monsoon in 252 districts throughout ten states, while in Maharashtra crop yields fell by more than 40 per cent. Durack et al find that ocean salinity decreases by 8+\-5% for every degree C of global temperature rise. This reflects a stimulation of the water cycle, consistent with global warming theory. Global warming produces warmer seas, but also probably reduces the rate of cooling with height, and so the effects cancel each other out to some extent. 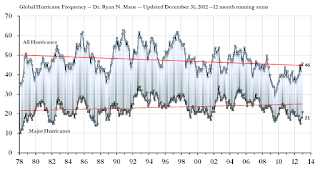 The graph below shows global hurricane energy from 1972-2012. The red trend-lines suggest that total numbers of hurricanes are decreasing, but that the numbers of major hurricanes is increasing. It seems that although trends are not completely unequivocal, extreme weather events are becoming more frequent, consistent with global warming theory. This is rather surprising and depressing, as we have only so far experienced about 0.7C of actual warming, so if there is an appreciable weather effect now, further increases are going to produce some pretty unpleasant events. Reasonable contrarians (lukewarmers, the ones who do not deny the physics of carbon dioxide) should take note of this, since their own claims are that final temperatures will "only" reach about 1.5-2.5C. If we are getting extreme weather changes at 0.7C, what are we going to get at 1.5C, let alone 2.5C? More on this blog about hurricanes globally and in the Atlantic.